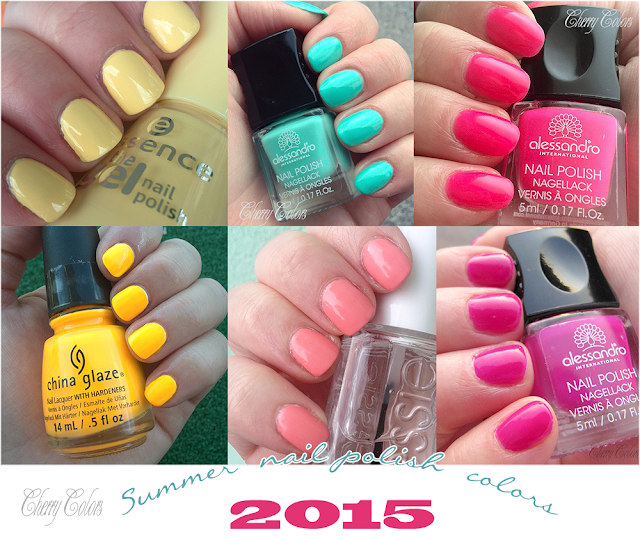 Summer (nail polish) Colors of 2015 - Cherry Colors - Cosmetics Heaven! I am back with another TOP post which will be featuring all the colors that are IN this Summer. Every Summer a must have basic color is plain white polish. And add some neons and you're good to go. But this Summer there have been seen color combinations that mixed a neon mint with some neon pinks, yellows and oranges. It's quite lovely to see. As you can see I picked a bit from this and that brand. 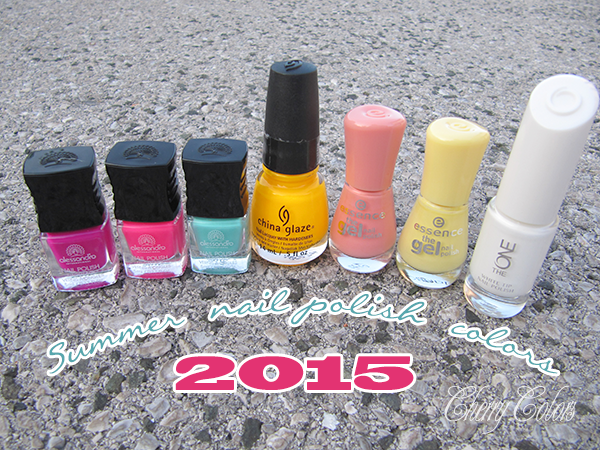 My favorites polishes (this Summer) come from Alessandro, China Glaze, Essence and Oriflame. Click on the swatch picture to view it full sized. 1. Oriflame white (for the french manicure, but it works well as an overall polish). Dries quickly and has a "drier" formula, more like an edis whitener. 2. Essence Indian Summer has a great formula and dies in a OK time. Love this color! 3. Essence Love is in the Air is one of my absolute favorite yellow polishes. Pastel and bright. 4. Alessandro Tropical Jungle Pinkini - the perfect neon pink. Dries semi matte and also quickly! 5. Alessandro Tropical Jungle Fantasy Island - a neon violet, that isn't all that very much neon. Camera doesn't do it justice because it is beautiful. 6. Alessandro Tropical Jungle Mintastic - A mint neon that makes pale skin look even paler. 7. China Glaze Sun Worshiper is a lovely neon yellowish orange that needs a white base underneath to get the color quicker and more opaque. Which are your Summer nail polish Must haves?